The Gareth and Janet Dunleavy Collection of Irish History and Literature includes a wonderful array of printed works dating from the eighteenth through twentieth centuries, accumulated by Gareth and Janet in the course of their scholarly research. 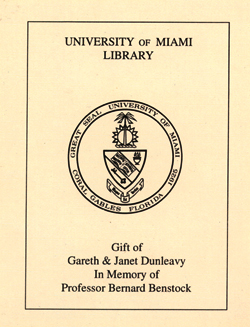 These volumes now grace the shelves of the Otto G. Richter Library at the University of Miami, and include a significant group of rare and unique titles housed in the Archives and Special Collections Department, where they join the personal papers of Gareth and Janet Dunleavy. The Dunleavys donated this treasure of Irish literary and historical materials in memory of their dear friend, the late Bernard Benstock, a colleague who served the University of Miami in many capacities, including chair of the English Department, founding editor of the James Joyce Literary Supplement, and the creative force behind the James Joyce Birthday Conference, held annually at the University of Miami. The Dunleavy Collection enhances the Library’s growing cache of Irish literary and historical resources, and these materials will benefit future generations of students and scholars dedicated to the exploration of Irish history and literature. As noted, the collection includes both historical and contemporary titles, and one eighteenth century work, Morison's Edition of the Poems of Ossian, the Son of Fingal, published in 1795 is present. Notable nineteenth century titles include: A Narrative of What Passed at Killalla, in the County of Mayo, and the Parts Adjacent, During the French Invasion in the Summer of 1798. By an Eyewitness, (London, 1800); Parnell and His Island, (London, 1887); Abhrain Gradh Chiuge Connacht. [Love Songs of Connacht] (Being the Fourth Chapter of the Songs of Connacht") now for the first time collected, edited, and translated by Douglas Hyde, (London, 1893; 1905); Chronicles of Eri: Being the History of the Gaal Sciot Iber, Or, The Irish People. Translated From the Original Manuscripts in Phoenician Dialect of the Scythian Language by O'Connor, ( London, 1822); Essay on Irish Bulls. Second Edition, corrected. (London, 1803); and An Introduction to the Irish Language: In Three Parts., (Achill, 1843). Twentieth century titles include many fine press and limited edition volumes personally inscribed to Gareth and Janet Dunleavy. The work of authors and poets such as Brendan Behan, Douglas Hyde, Thomas Kinsella, Brendan Kennelly, and James Liddy are represented. The Archives and Special Collections Department is proud to present this virtual exhibition of materials from the Dunleavy Collection. This virtual exhibition compliments the initial library exhibition of Dunleavy materials, presented in the Richter Library from January 29 - March 28, 1998. This exhibition celebrated the donation of materials by the Dunleavys and marked the opening reception for the Twelfth Annual James Joyce Birthday Conference. The opening reception offered a unique opportunity to gather many friends and colleagues of Gareth and Janet, and to thank Gareth Dunleavy in person. Unfortunately, Janet Dunleavy was unable to join us owing to an illness, and our thoughts and prayers remain with both Janet and Gareth. I am pleased to include the texts of remarks delivered at in the Archives and Special Collections Department, before the participants of the Twelfth Annual James Joyce Birthday Conference, by Gareth Dunleavy, Zack Bowen, Pat McCarthy and Shari Benstock. Zack, Pat and Shari kindly offer their unique perspectives on Gareth and Janet. We are privileged to share their memories and stories and learn more about Gareth and Janet, two people whose personal and scholarly lives are so entwined as to be one. This one life is now preserved at the University of Miami and stands as a shining example to future generations of students and scholars of Irish history and literature. At the opening reception, I remarked upon the difficulty that librarians and curators sometimes face in crafting a truly meaningful, descriptive title for exhibitions of rare books and manuscripts. The Dunleavy Collection generated no such problem, however. My letters and conversations with Gareth immediately revealed the lifelong friendships and relationships that prompted the generous donation of books and manuscripts. The sheer delight and honor expressed by my colleagues in the English Department upon learning of Gareth and Janet’s intentions provided the final impetus for the title, "A Gift of Friendship: The Gareth and Janet Dunleavy Collection of Irish History and Literature." The Dunleavys have succeeded, as they always do, in furthering the study and teaching of Irish history and literature, as they continue to enrich the lives of an ever-expanding reservoir of friends. I am proud to count them as new friends of the University of Miami Library. I invite you to explore the Dunleavy Collection and to join in our celebration of this wonderful donation. Gift of Friendship... was curated by: William E. Brown, Jr. and Ruthanne D. Vogel. This Web site was placed online in 1998; it was last updated January 5, 2007.